The babies are 3 months old. It's hard to think about how fast time has flown by. When we look at their newborn pictures it's like we had totally different kids! They are smiling all the time, grabbing at things, "talking" by making sweet little baby noises, and wanting to laugh out loud. They can sit up propped up, and both have really good head control. They are also sleeping really well, for the most part. Mom and Dad have rejoiced several times when we weren't awakened until 5:00 or 6:00 am. They seem to be progressing right along schedule. Of course we've been taking loads of pictures of the babies at home, but I wanted to get some "professional" shots done. Not knowing how they would react, we went to JC Penny to get the first ones done. It wasn't a terrible experience. We didn't have to wait too long, and the babies didn't have a melt down. 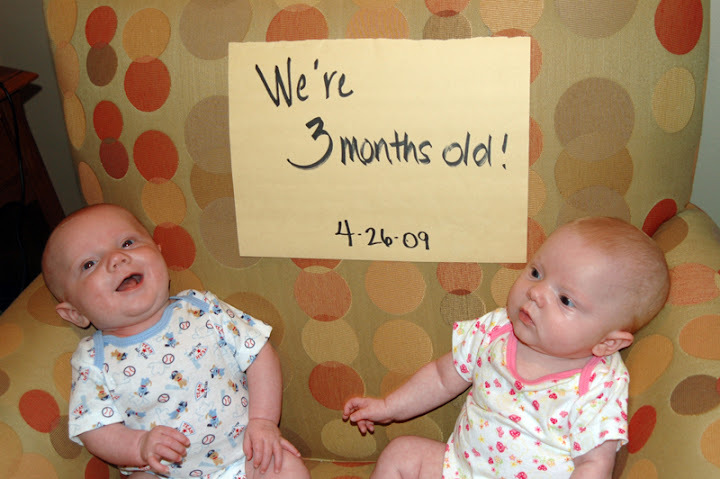 However, it's extremely hard to get two 3 month olds to smile at the same time. Olivia, the perpetual grinner, wouldn't crack a smile and of course Hulse was full of smiles. We got a couple of good shots. Hopefully when we go back for 6 month pictures they will cooperate at the same time. Sunday was a special day for the babies and us with baby dedication at church. This is a public way of saying we commit to surrender Hulse and Olivia to the Lord and to raising them as Godly parents. It's a great feeling as parents to have a congregation of people pray for you and your children. I know that our church is just as dedicated as we are to teaching our kids how much Jesus loves them. It is an awesome privilege and responsibility to be given the gift of children!